References - Site de lejardindemamereeng ! Producers of roses, they multiply more than 2000 varieties each year. 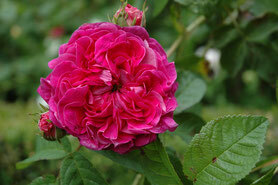 Producers specialized in the culture of modern and old roses. Expert in roses and fruit trees. Hundreds of varieties of shrubs and viburnum. Christian Bessard offers awide choice of rare trees ans shrubs such as cornus, malus, prunus, acer. Thierry de Ryckel, an expert for hortensias, hellebores and hemerocalles. L'Association Roses Anciennes en France aims at the knowledge, at the culture, at the conservation, and at the promotion of old roses. The Hostellerie de Saint Georges, near the garden, proposes a fine, delicious and elaborate home cooking only of quality products.